I’ve got a 5 year old son and he’s already been out with me a few times scouting and shed hunting. We don’t watch the fictitious outdoor channels in our house for obvious reasons. I emphasize respecting animals and the beauty of the outdoors frequently to him as well as only killing what you will eat. It’s my job as his dad to make sure he’s not a product of the “industry” and teach him the importance of the experience and the hunt, not just to kill. With deer numbers being low we may just put a few squirrels in the freezer. It was really bad in Calhoun as well. Not many shots heard on any day. In the past, I have seen more deer in one morning hunt than all the deer I’ve seen all of second season. Pathetic. Absolutely pathetic. Plenty of sign-has to be all nocturnal. tag soup saw one deer in 4 days, the worst season if ever. I know most on here will tell me to take my meds, or I am crazy , or I shouldn’t drink before I hunt. Last night I was sitting in my ground blind reflecting of seasons past when deer were as plentiful as fox squirrels . When I heard a noise to my right down in the bottom of my ravine . I swear it was the biggest grayest coyote I had ever seen. I blinked again and again to see if I was truly seeing it. It had to be at least 75 or 80 pounds. It was sniffing around the ground and disappeared into the neighbors crp field. I am wondering if it was a coy-dog , big coyote , or God forbid wolf. KnoxCounty…Friday morning I too had a huge Coyote sighting… I had two does walking right towards me. I was watching them from approximately 125 yards away. When they got about 80 yards away they stopped and looked to their left. On top of a hill was the largest Coyote I have ever seen. I was hoping this big canine was coming down for breakfast. He would’ve gotten lead poisoning for sure. Instead he decided to stay up on the hill and travel along the ridge and leave us. That was one lucky scavanger. I was only able to get out 1 time this whole season due to work schedule. I went out sunday afternoon and this guy showed up with a doe to eat some beans in my food plot. I only have one permit which is enough for me so I’m done for the year. Very nice trev 33. 2nd season I only went out Sun afternoon. Heard some pheasants and a saw a flock or two of birds. Still enjoyed being outside for a few hours. Seemed to be more shooting around me than on opening day. Congrats trev33. 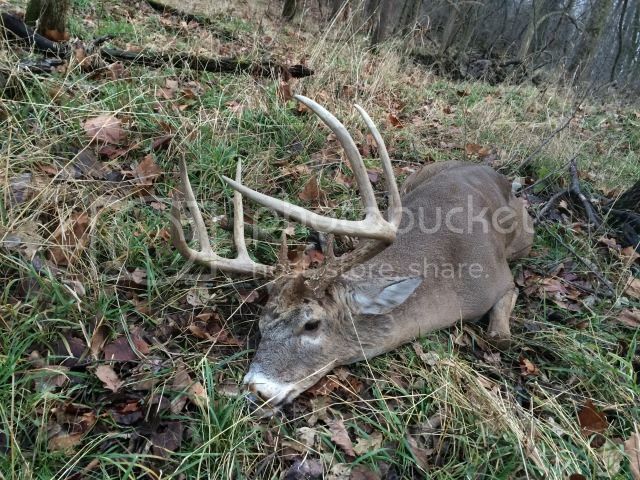 Thats one heck of an 8pt.